Fee mining sites are places where you can pay a fee to dig, pan, or search for rocks, minerals or gemstones and keep whatever you find. There are many places in the United States where you can pan for gold, wash gravel for gemstones, or split rocks to find fossils and have a reasonable chance of being very successful. We have been to fee mining sites many times, had some fun, and found some nice materials. We did not make a great find every time but it was a good experience overall. One of our favorites is looking for Herkimer "Diamonds". 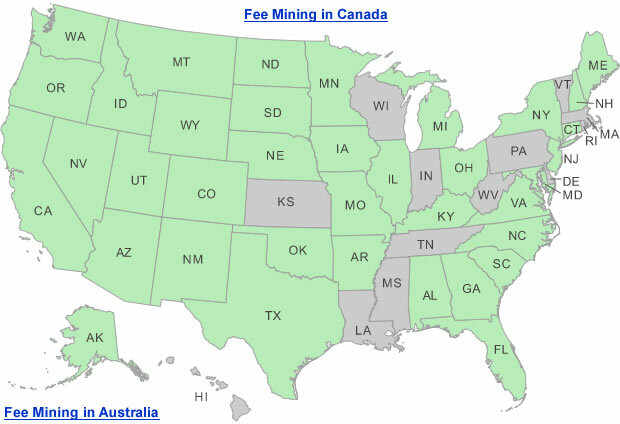 If you know of other fee mining sites not listed here, please let us know by emailing the URL of their website to: contact(at)rocktumbler.com. To be listed a site must have a website and pass our review. We do not include sites where collectors search through materials that have been "salted" with things to find or where materials from other mines or locations are hauled in. Not all of the sites listed below require a fee. Please let us know about other sites! Crater of Diamonds State Park Diamonds and 40 other types of rocks and minerals including: lamproite, amethyst, banded agate, jasper, peridot, garnet, quartz, calcite, barite, and hematite. Wegner Crystal Mines & Ranch Crystal Forest Mine and Phantom Mine group dig and tailings collecting area. Oceanview Mine Tourmalines, kunzites, morganites and more. Fossil Expeditions Mammal, reptile and shark fossils. Rucks Pit, Fort Drum Crystal Mine Fossils and crystals. Poland Mining Camps Pollucite (gem grade), spodumene, kunzite (cab grade), muscovite and perhamite (tan spheres) with white fluorapatite. Emerald Hollow Mine 63 different gems and minerals. Rose Creek Mine Ruby, sapphire, garnet, amethyst, citrine, moonstone, topaz, smoky quartz, rose quartz, quartz crystals and more! Stillwell Ranch Many different kinds of agate and gemstones. Morefield Gem Mine Over 80 different minerals. Geology Adventures Guided trips to gem and mineral collecting sites. Please Let Us Know About a Fee Mining Site! If you know of other fee mining sites not listed here, please let us know by emailing the URL of their website to: contact(at)RockTumbler.com To be listed a site must have a website and pass our review. 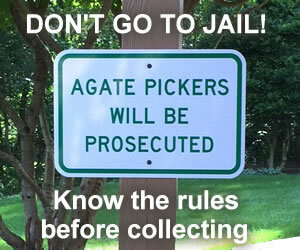 We don't include sites where collectors search through materials that have been "salted" with things to find. Rock Tumbling Recipes is an occasional email message that we send a few times per year. It will help you improve your tumbling results, learn new methods, maintain your tumbler, and save time and money while tumbling. It is free, will not produce spam, you can unsubscribe at any time. © 2009-2017 RockTumbler.com. All Rights Reserved. Images, text and code on this website are property of RockTumbler.com. All other use is prohibited.